If your penchant for frequently washing your hands ventures into obsessive-compulsive disorder (OCD) territory, by all means, you’re probably safe to use Android’s swipe-to-unlock security feature to keep nosy Nancys from spying your contacts and text messages. 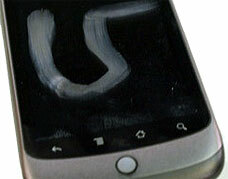 But for the rest of us, so-called ‘”reverse smudge engineering” might be the bane of greasy fingers. Canadian software developer, entrepreneur, and current Google employee, Tim Bray, warns that the swipe-to-unlock feature in Android is fairly easily thwarted just be looking at the pattern of smudges your fingertips leave behind. “Last year I was touring around with a bunch of Googlers doing DevFests and Developer Days and so on, and an emergency arose when a couple of colleagues had my original Galaxy Tab and needed to use it for something, but I wasn’t there. They managed to figure out my pattern by looking at the fingerprints on the glass and it only took them a few minutes. Maybe I’m a little greasier than average, but that’s still sobering,” Bray explained in a blog post. Bray, whose opinions are his own and don’t necessarily reflect that of Google’s, favors the PIN feature, which works for him because he feels he could punch in his code “really, really fast” so even if someone were to peer over his shoulder, they’d have no clue what numbers he pressed. Do you lock your phone down, and if so, what method do you use?